This weekend I went home to Detroit. This was the 20th Year Reunion of my high school graduation. Not only did I make the trip with my family. However, my boy from back-in-the-day, Damon, who lives in VA, made the drive to my house. Afterwards, we all hit the road to Detroit. It was great to see my friends and classmates from Murray-Wright Senior High School. The one obvious thread throughout the weekend was the varied success of the graduates. 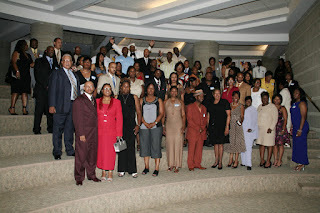 Many people looked well and shared stories of relationships that blossomed from the 10th Year Reunion. I saw at least three couples that “hooked-up” at the 10-year reunion. They are either married or very serious. However, a somber reality is the fact that even though the school building remains, it is no longer M-W with the blue & gold. It is an alternative school. Therefore, it is even more important to continue the legacy considering they will no longer pump out new M-W graduates. Some individuals I will not see for another five or 10 years. However, some I may see rather soon. Whatever the situation is, I pray for their well-doing and their increase as their soul may increase.